November 2017: OC Weekly: Chardonnay, Shucking and Sake: It’s Your OC Grub Guide! March 2017: Culture Trip: The 14 Most Stunning Restaurant Settings in the U.S.
February 2017: Culture Trip: The 14 Most Stunning Restaurant Settings in the U.S.
February 2016: Chamber Announces ‘Spirit’ Winners Read more. February 2016: 2016 Orange County Valentine’s Day Guide. Read more. February 2016: Laguna Beach Magazine – “Sip & Shuck” Read more. July 2015: Sentinel restaurants featured in the new Laguna Beach Travelers’ and Residences’ Guide, available for purchase here. Read more. July 2015: The Deck on Laguna Beach has an incredible ocean view and a new menu. Executive Chef Rainer Schwarz has introduced a new seasonal menu that showcases the freshest seafood brought to life with a vibrant array of seasonal ingredients. Read more. Summer 2015: Enjoy delicious food and fun cocktails while you sit at The Deck on the edge of Laguna Beach. They pair classic, upscale beach dining with beautiful views from every table. Read more. November 2014: The Deck and Driftwood Kitchen’s 2nd Annual Champagne & Oyster “Sip & Shuck” raises more than $10,000 for the Pacific Marine Mammal Center. Read more. 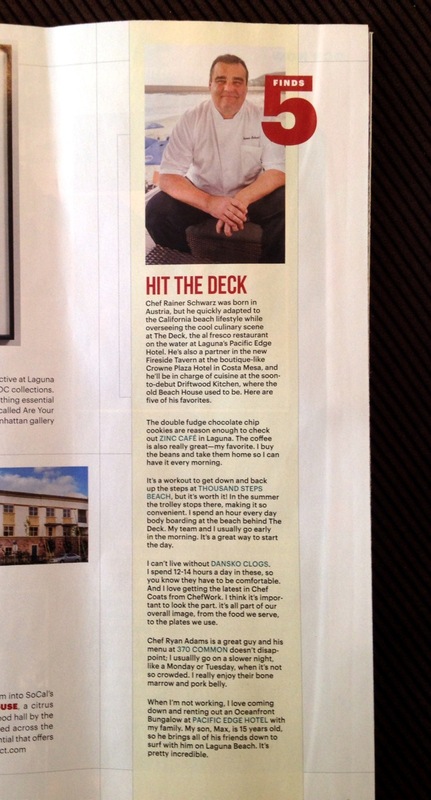 October 2014: Executive Chef Rainer Schwarz Wows with Winter Menu at The Deck On Laguna Beach. Read more. July 2014: Riviera Magazine: The Finest 50: Rainer Schwarz. Dine at The Deck, and your palate will be plied with the freshest fish creations you’ll ever taste. Read more. June 19, 2014: OC Wino: Happy Hour in Laguna Beach with the OCWino Team. The Deck wasn’t too crowded as it can be on the weekends, but it was a great place to watch the sunset, drink a final cocktail, and make new friends at the bar with Laguna locals. Read more. June 2014: Orange Coast Magazine: The World’s End – Best Bars in OC. Read more. June 16, 2014: Stu News Laguna: Big Crowds and Big Time Talent Highlight Laguna Open. Laguna’s 59th Annual Men’s Laguna Open was deep with talent and saw some of the biggest crowds since the national sponsor monday days of the 80’s and 90’s when the prize purses were much bigger. Read more. June 11, 2014: CBS Los Angeles: Best Places for Grilled Cheese in OC. You probably don’t think of grilled cheese as a gourmet meal, but at The Deck on Laguna, it is just that. This sandwich is made with cheddar, fontina, bacon and caramelized onions on a good crusty French bread. Read more. June 7, 2014: Laguna Beach Best: 59th Annual Laguna Volleyball Open This Weekend. For nearly 60 years, the world’s best volleyball players have gathered at Main Beach in Laguna Beach to compete in the Laguna Volleyball Open. This year’s event will take place this weekend, June 7th and 8th. Read more. June 6, 2014: Greer’s OC: Historic Volleyball at The Deck. The Deck On Laguna Beach will be sponsoring the 59th annual Laguna Open on Saturday and Sunday which means the world’s best volleyball players will be gathering at the Deck before, during, and after the games. Read more. June 5, 2014: Where OC: Laguna Open at The Deck. Watch all the action of the men’s volleyball tournaments on Main Beach then head over to The Deck at sundown for the Players Lounge After Party. Mingle post-tournament in their luxurious beachside bungalows for a chance to meet the competing athletes while savoring food, cocktails and music. Read more. June 4, 2014: OC Weekly: Negroni Week at The Deck. A list of participating restaurants that have chosen Inspire Artistic Minds as its benefactor include The Deck on Laguna Beach (a part of Sentinel Restaurant and Hospitality Group and linked to this week’s On the Line subject, Rainer Schwarz). Read more. May 13, 2014: OC Mom Dining: The 59th Annual Laguna Open. The World’s Best volleyball players will come together for the 59th Annual Laguna Open hosted by The Deck on Laguna Beach. The family-friendly event will happen on June 7th through the 8th on the beautiful Laguna Beach sand. Volleyball fans can watch all the action on the sand while enjoying oceanfront dining on the outdoor patio at the Deck on Laguna Beach. Read more. May 8, 2014: Laguna Beach Magazine: Grilled Cheese, Please! The Deck on Laguna Beach offers another incredible oceanfront dining experience with a mouthwatering grilled cheese sandwich on its menu. Available as a lunch or dinner entree, the Deck’s version of this popular sammie features first-rate aged Vermont cheddar, Nueske bacon and caramelized onions served on grilled French sourdough bread with butter pickles and kettle chips. Read more. May 1, 2014: Much Ado About Fooding: The beach cities are notorious for providing such a breathtaking view, and Laguna Beach is no stranger to good food. We explored the new spring menu at The Deck in Laguna Beach during a special sunset media dinner one evening and got a dose of that “SoCal lifestyle” with some great company and eats. Read more. April 15, 2014: OC Weekly: 10 Places for Easter Dining in OC. Celebrating beachside lasts all day long at the Pacific Edge Hotel. Things start off on a sweet note with croissant and muffin baskets for the table. Grilled asparagus bundles (pictured) served with piquillo pepper sauce and pan-seared Northern halibut are just a couple of the options you’ll be faced with this Sunday. Read more. April 14, 2014: OC Register: Hit The Deck. Chef Rainer Schwartz was born in Austria, but he quickly adapted to the California beach lifestyle while overseeing the cool culinary scene at The Deck. Read more. February 2014: Laguna Beach Magazine: The Deck on Laguna Beach and The Bungalows at Pacific Edge Hotel rang in the New Year with a themed “Great Gatsby-style” progressive dinner party. Read more. February 4, 2014: OC Mom Magazine: Valentine’s Day at The Deck: Beach with Sea, Sunset and Sounds. The Deck on Laguna Beach will feature a special A La Carte 3-Course Menu, Champagne, & Live Music this Valentine’s Day. Read more. February 4, 2014: Food Enthusiast: The Deck on Laguna Beach, long favored as one of the most romantic spots in California, has prepared a special Valentine’s Day at the Beach for couples. Each couple dining at The Deck during the Valentine’s Day Beach event will receive a complimentary box of sweets along with a takeaway for a future visit. Read more. February 3, 2014: The Examiner: Top 10 suggestions for a memorable Valentine’s day – your way. On Friday the 14th, The Deck will be featuring a special a-la-carte 3-course menu, with champagne and live music by Jon Salazar, for Valentine’s Day. Guests can reserve a ‘Beachside Bubbly Table’ with unobstructed views of the beautiful sunset, to do this they must purchase a bottle of sparkling wine or champagne valued at more than $45. Read more. January 31, 2014: OC Mom Dining: Orange County Valentine’s Day Dining Guide. On Friday, February 14 from 4 to 9:30 p.m., The Deck will feature a special a la carte 3 course menu in a beachside setting and live music by Jon Salazar. Guests wishing to enjoy the perfect view of the sunset while sipping champagne will have an opportunity to reserve a Beachside Bubbly table in the front row of The Deck. Read more. January 8, 2014: CBS Los Angeles: Healthy Dining Locations For The New Year: The Deck on Laguna Beach features the freshest dishes using seasonal ingredients. 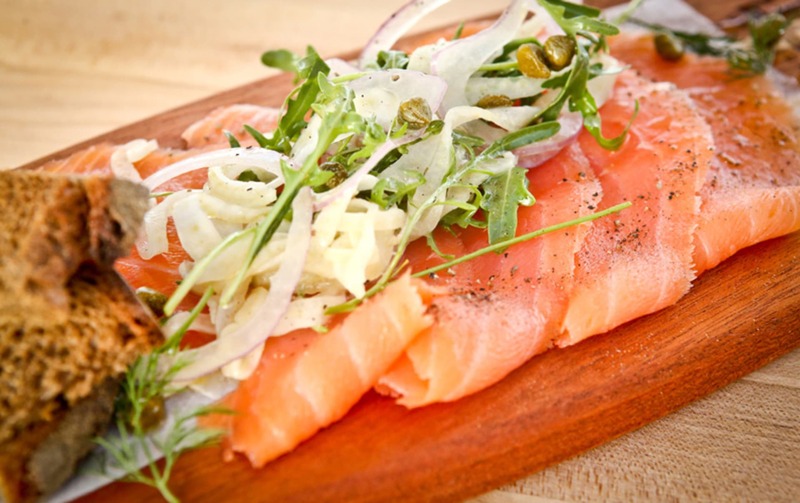 One of the highlights on their healthy menu is the New Zealand Ora King Salmon that is rich in omega 3 fatty acids. Or another two healthy dining recommendations are the Steamed Venus Clams & Mussels and the Tuscan Kale Caesar Salad. Read more. December 30, 2013: CBS Los Angeles: What you’re doing this week: December 30th. Welcome the New Year with beach-Gatsby style. It’s “A Roaring Affaire NYE 2014,” a Gatsby-inspired event at The Deck and The Bungalows on Laguna Beach. Read more. December 24, 2013: LA Times: New year’s Eve 2013 in the L.A. area. The Deck in Laguna Beach and the Bungalows in Laguna Beach will have Roaring Affaire parties with Gatsby-inspired cocktails, a tasting dinner and late night festivities. Read more. December 19, 2013: OC Register: Make your plans to ring in 2014 in O.C. Join the glitz and glamour at The Deck with appetizers, live DJ, party favors, dancing, a broadcast countdown from New York and a midnight champagne toast. Read more. December 17,2013: OC Mom Dining: Laguna Beach Rings in the New Year in Style at The Deck and Bungalows with “A Roaring Affaire NYE 2014”. Read more. December 12, 2013: Food Enthusiast: The Deck on Laguna Beach Rings in the New Year with “A Roaring Affaire NYE 2014″ Gatsby Inspired Experience. December 31st from 7 pm – 1:30 a.m. Read more. December 12, 2013: OC Foodies: On Tuesday, December 31st, The Deck on Laguna Beach and The Bungalows at Pacific Edge Hotel will welcome 2014 with a celebration that includes a Progressive Cocktail Party, Tasting Dinner, & Late Night Soiree beginning at 7 p.m. on Tuesday, December 31 through 1:30 a.m. on Wednesday, January 1, 2014. Read more. December 12, 2013: New Year’s Eve Press Release – A Roaring Affaire at The Deck. December 5, 2013: A $30,000 check will be presented to representatives of The Surfrider Foundation from the Sailor Jerry program, which donated fifty cents from every bottle of Sailor Jerry sold at participating California retailers during the months of July and August and 25% of sales from limited-edition shirts sold on the Sailor Jerry website. A second donation check of $3,300 will be made to the Surfrider Foundation South Orange County Chapter from proceeds generated during the Inaugural Sip and Shuck – Oysterfest recently held at The Deck on Laguna Beach. Read more. November 6, 2013: “Sip & Shuck – Oysterfest” is this Sunday, Nov. 10 at The Deck on Laguna Beach and The Bungalows at Pacific Edge Hotel with Master Ecailler Christophe Happillon and Champagne Nicolas Feuillatte Ambassador Francois Beall. Read more. October 16, 2013: The Deck on Laguna Beach and The Bungalows at Pacific Edge Hotel will host “Sip & Shuck – Oysterfest” with special guests and Champagne Specialists on Sunday, November 10th, 2013. Benefiting the Surfrider Foundation. Read more. October 10, 2013: The Deck on Laguna Beach unveiled a responsive website that incorporates an updated branding style reflective of The Deck’s refreshed new look and feel. Read more. October 7, 2013: OC Register Family Magazine writes about the “killer” cocktails at The Deck, offered this Halloween. Get in the holiday spirit with a “Bloody Sangria” or “Green Slime”. Read more. September 18, 2013: The Deck on Laguna Beach Coastal Cuisine Highlighted at the Chamber of Commerce “Taste of Laguna & Business Expo” Read more.